Robert Kubica believes he could make an effective full-time comeback to Formula 1 if he was given the chance. The Pole has not raced in F1 since 2010 after suffering life-changing injuries in a rally crash but drove in Spanish GP practice as Williams reserve. He said: "I saw it in winter testing, I saw it now. Whatever is missing is only a question because I am doing it every two months - if something is missing. "If I had a chance to drive every week, there is even more room to improve." Asked to clarify whether he was ready to make a return to F1 after seven years away, the 33-year-old told BBC Sport he "could make a comeback now" if he was given the chance, but it was not his decision. He added: "If I did not try to do it, I would not be here. I appreciate the opportunity. It gives me the opportunity to live my passion." But he added: "I am not thinking what will happen in the future." Why has Kubica been out for so long? Kubica has only partial movement in his right arm and hand as a result of the limb being partially severed in a crash on a rally in Italy in February 2011. The accident led to a long rehabilitation but, after a series of F1 tests last year, Kubica had hopes of a full-time return with Williams. A deal was close but after Kubica drove in a post-season test in Abu Dhabi, the team were not convinced he was ready, and gave the drive instead to Russian novice Sergey Sirotkin. Williams took on Kubica as a reserve, partly to see if he they could be more convinced he could return to his former high level if he was given more time. Spain was his first of three practice sessions scheduled for this season, the other two being in Austria in July and Abu Dhabi at the end of the season. 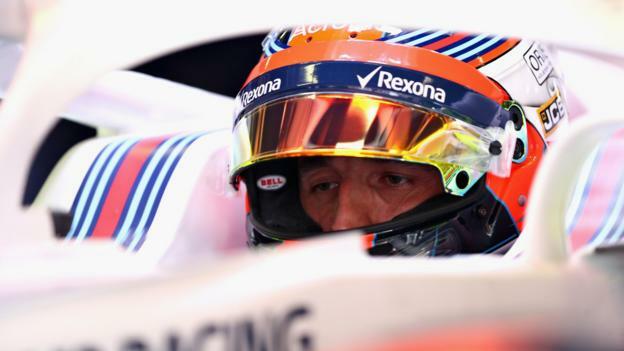 Kubica had not driven the car since pre-season testing in early March but he ended the session 1.2secs quicker than race driver Lance Stroll, who crashed midway through. Asked if he took anything from the lap times, Kubica said: "No. Because I know my value so I don't have to look lap times. Very simple." He added: "Although it sounds strange, often people forget motorsport is sport and all sportsman are practising training as often as possible. "I am not driving often but it is already the sixth, seventh, eighth time and it is becoming more natural, which is good. All sportsmen, whatever sport you do, you look for what you are doing to become natural because this gives you better comfort, better way of doing things. "It is more than two months since I drove here, it is not easy, things are changing, conditions are different but I managed pretty well and I am happy." On-board footage of Kubica during the session showed that he does not grip the steering wheel with his right hand, and that he takes it off the rim in slow corners and uses it to guide the wheel from below. Kubica said: "I drive like my body and my limitations leave me to do it. "After my accident, I discovered that to do a roundabout in the road car, you don't have to grab the steering wheel, you can use friction to turn. "F1 is not a road car, but I have been also in school where they give you a bird in the hand and you have to hold it (so) that it doesn't fly away but you cannot hold it too much that it gets scared. This is the way you have to hold the steering wheel. "When I was racing in the past, in Malaysia on one of the first weekends I did in 2006 (as BMW test driver), there was footage when you see me driving with three fingers open. And the engineers were shocked. "And probably the way I drive is enough for what I am doing, otherwise I would not be here and I would not have this opportunity, I would not have testing on Wednesday (where I am scheduled to do) 160 laps in F1 car. "Then, that it looks different than 10 years ago and to the others, I know. But the outcome is probably the same or nearly the same."